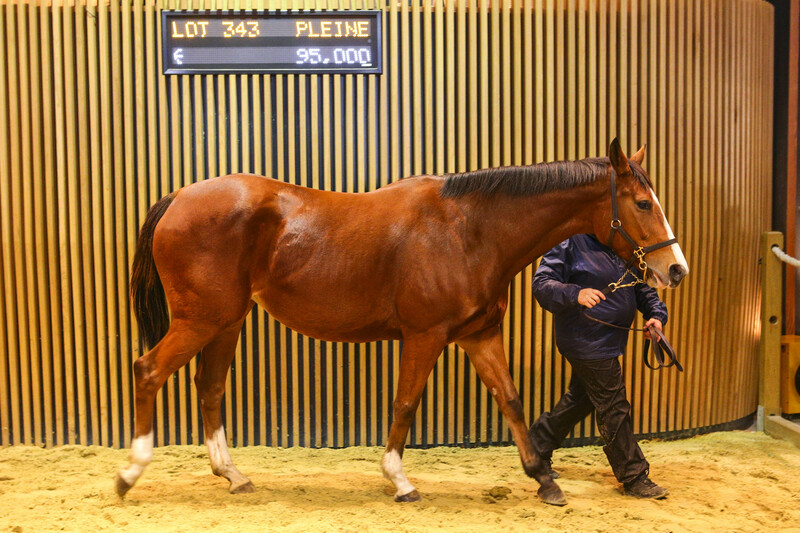 Waldfee, a four year old Dansili mare, made her second appearance at the Arqana December sale in two years. In 2017 she was offered out of training by the Haras de Saint Pair and bought for 24.000 euros by the Ecurie Un Crin d’Or. A year later she was reoffered in foal to Charm Spirit by the Haras des Embruns, and this time round her value had soared to 100.000 euros, at which price she was bought by Chris Richner Bloodstock. Waldfee is a daughter of the Saint Pair mare Waldjagd and they come from the ‘W’ family developed by Gestut Ravensburg. The family continues to produce a stream of top class horses and during 2018 Waldgiest won the Group 1 Grand Prix de Saint Cloud as well as two Group 2 races, his half sister Waldlied won the Group 2 Prix de Malleret and then the two year old filly Wonderment won the Group 1 Criterium de Saint Cloud. Waldjagd herself looks set to add to the family’s laurels as her two year old colt Urwald, by Le Havre, was an impressive winner at Saint Cloud for the Haras de Saint Pair and trainer Andre Fabre on his only start to date. Waldjagd’s yearling Muhaarar filly was bought by Tina Rau Bloodstock and Nicolas Clement for 120.000 euros at the Arqana October sale. Waldjagd has a filly foal by Intello and is in foal to Almanzor.